Disk duplication is the main feature of Atola Bandura. The tool can image hard drives at 210 MB/s. Of course, conventional (magnetic) disks will not go any faster than they can physically read from the platter; the fastest SATA-II 7200 rpm drive we've got in our lab images at 170 MB/s, therefore, in most cases only the hard drive itself will be the bottleneck. 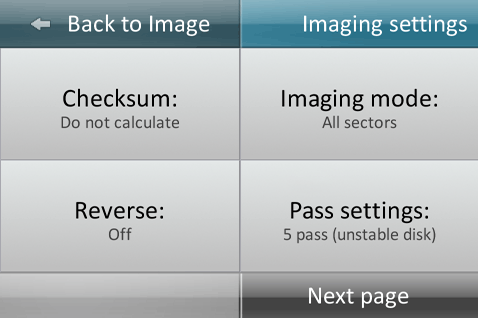 Atola Bandura supports multi-pass imaging with many adjustable parameters for better handling of damaged hard drives: reverse imaging, soft and hard resets, automated power cycles (adjustable), Read Long (Discard ECC) option. To speed up things, there is an option to image only those sectors that contain user data.